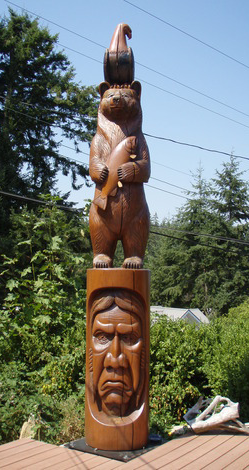 I specialize in large carvings influcenced by Pacific Northwest wildlife. Recently I have branched out into smaller more detailed pieces. Whether you just want to have some fun with your outdoor decor, are looking for something special for the person who has everything or you want a unique sculpture for your home, cottage or business, an original chainsaw carving could be the answer for you. Have a look around and then feel free to contact me with any question, comments or ideas that you have.